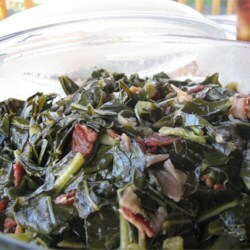 I'm from the South and these are THE BEST collards. I've impressed both of my Southern grandmothers with this recipe and have even impressed a few Yankees :-). The only change I would make is to cook the collards a bit longer. I sometimes will start them on the stove, then move them to the crock pot for several hours. To me, the longer collards cook - the better.